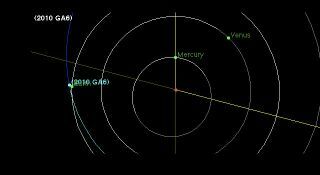 This NASA graphic depicts the orbit of newfound asteroid 2010 GA6 as it flies by Earth on April 8, 2010 at a distance of 223,000 miles (359,000 km), about nine-tenths the distance between Earth and the moon. Full story. A newly discovered asteroid will zip close by EarthThursday, but poses no threat of crashing into our planet even though it ispassing within the orbit of the moon. The asteroid, called 2010 GA6, is a relatively smallspace rock about 71 feet (22 meters) wide and was discovered by astronomerswith the Catalina Sky Survey in Tucson, Az. The space rock will fly within the orbit of themoon when it passes Earth Thursday at 7:06 p.m. EDT (2306 GMT), but NASAastronomers said not to worry?the planet is safe. "Fly bys of near-Earth objects within the moon'sorbit occur every few weeks," said Don Yeomans of NASA's Near-Earth ObjectOffice at the Jet Propulsion Laboratory in Pasadena, Calif., in a statement. At the time of its closest pass, asteroid 2010 GA6 willbe about 223,000 miles (359,000 km) from the Earth. That?s about nine-tenthsthe distance between Earth and the moon [moreasteroid photos]. The space rock is not the first asteroid to swing closeby Earth this year. In January, the small asteroid 2010 AL30 passed within80,000 miles (130,000 km) when it zipped by. Other space rocks have flown pastEarth at more comfortable distances greater than several hundred thousandmiles. NASA routinely tracks asteroids and comets that may flynear the Earth with a network of telescopes on the ground and in space. Theagency?s Near-Earth Object Observations program, more commonly known asSpaceguard, is responsible for finding potentially dangerous asteroids andstudying their orbits to determine if they pose a risk of hitting the Earth. NASA?s latest space telescope, the Wide-field InfraredSurvey Explorer (WISE) launched in December, has been given the task of huntingnewasteroids that were previously undetectable because they shine only in theinfrared range of the light spectrum. So far, the WISE telescope has been discovering dozensof previously unknown asteroids every day. Some of those space rocks have beentagged for closer analysis since they may be potentially hazardous to Earth,WISE mission scientists have said.